The PROPOLAIR Basic Models are suited to any environment due to their small size.Their stylish and cheerful patterns will sit easily in most interiors. The A1 model diffusers selectively and entirely diffuse the entire volatile fraction of propolis around the living space. They use the finest Italian propolis and release its components gradually and consistently into the air throughout the capsule duration. These devices warm up the propolis contained in the capsule, initially reaching wax fraction fusion and, subsequently, regulating the temperature in order to free each volatile fraction. The alternation between these two temperatures allows the complete release of all volatile substances. 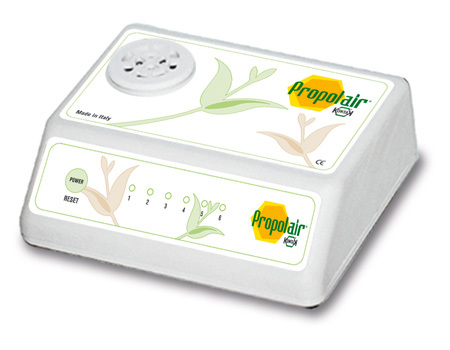 The ionizer model draws out the beneficial disinfectant and sanitizing properties of propolis. Through ionization, propolis particles entering the air are subject to a negative electrical charge which in turn attracts positively charged volatile airborne particles, such as bacteria, mould spores, viruses and fungi, which are subsequently treated with the antiseptic and antibiotic properties of propolis. These unwanted micro-organisms are consequently inhibited and cannot develop further. Negatively charged propolis molecules can also attract other airborne particles such as smoke and dust which, when trapped, fall to the ground. In this way, biological and chemical pollutants and toxic agents are removed from the air. Our respiratory system can therefore fully benefit from the purer air produced by the properties of propolis.